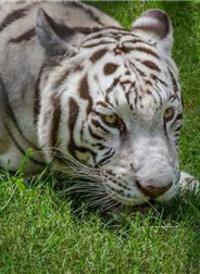 On 6/30/14, we received a call from someone looking for a new home for a five-year old female white tiger. She belonged to a breeder who was not getting the “results” he had hoped for, and the man wanted to get rid of her. Arrangements were made and now this beautiful girl has a new home! Karma, as we have named her, is the first female white tiger to call In-Sync Exotics home, and we are excited to welcome her to her new family! 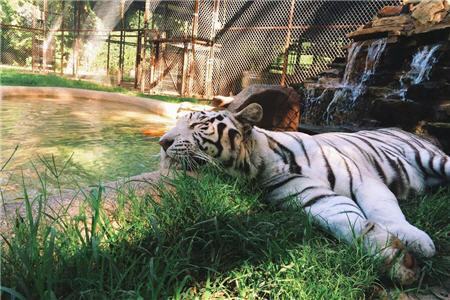 As a side note, white tigers are neither a separate species nor “albino.” The white coat is an expression of a recessive gene and is the result of breeding a male and a female that both carry the gene; the parents may be white or orange in color. 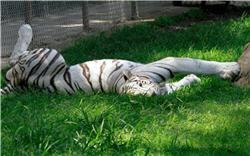 Sadly, white tigers are most often the result of inbreeding and many of them do not survive. 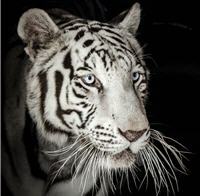 Because inbreeding rarely, if ever, happens in the wild, and because wild-born white tigers cannot camouflage themselves, they are almost completely non-existent in the wild.